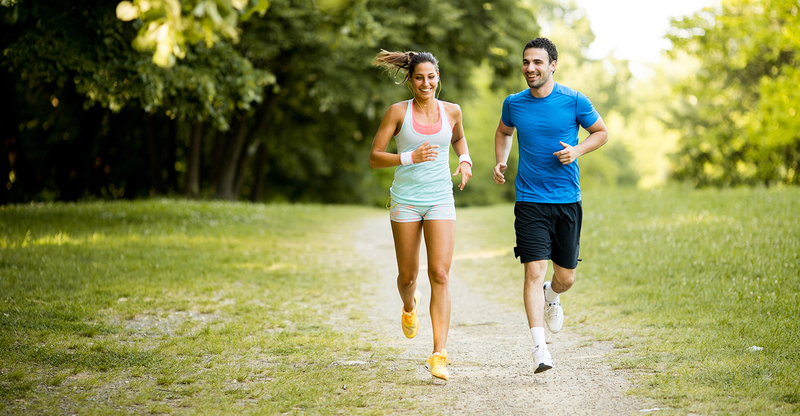 Jogging is an excellent fitness training where you run relaxed at a moderate speed. Did you ever dream of running five kilometers without a break? This program could well turn you into a 5k runner with a pace of about 7 minutes per kilometer in just about eight weeks. Jogging is a less intensive or slower form of running. We call it smooth or slow running. When you increase your speed and get out of the range where you still feel relatively comfortable and able to breathe quietly, you have switched from jogging to fast running. For this program we want you to always enjoy the flow of slow running. The level of perceived exertion should stay in the moderate range most of the time, with a heart rate around 60% of your maximum heart rate. The correct title might rather be 35 minutes jogging for beginners instead of 5k run. At the end of the program, you will run 35 minutes without a break. To reach 5 kilometers in this time your average speed or pace will be 7 minutes per km or 8.57 kilometers per hour. DAY 1: Start with a slow one-minute run followed by 1.5 minutes walking. Repeat six times. DAY 2: A slow one-minute run followed by 1.5 minutes walking. Try to repeat eight times. DAY 3: A slow one-minute run followed by 1.5 minutes walking. Repeat eight times. DAY 1: Increase the runs to 1.5 minutes. Followed by 2 minutes of walking. Repeat six times. DAY 2: 1.5-minute runs again. Followed by 2 minutes of walking. Repeat six times. DAY 3: 1.5-minute runs again. Reduce the walking breaks to 1.5 minutes. Repeat six times. DAY 1: Build up to 2.5 min runs. Each run is followed by the same time of walking. DAY 2: Build up to three-minute runs. Each run is followed by the same time of walking. DAY 3: Repeat the three-minute runs. Let’s make the walking a bit shorter. DAY 1: Your first four minutes run. Let’s repeat it and make the walking break a bit shorter. DAY 2: Your first five minutes run. Let’s repeat it and make the walking break a bit shorter. DAY 3: Five-minute runs seem to work for you. Let’s repeat it and make the walking break a bit shorter. DAY 1: Your first 6 minutes run. Less than half the running time for walking. DAY 2: Your first 8 minutes run. Less than half the running time for walking. DAY 3: Let’s start to build up to longer runs with two 8 minute runs and just one walking interval between them. DAY 1: Your first 10 minutes runs and just one walking interval in between. DAY 2: Two 10 minute runs with one walking interval. Let’s make the walking interval a bit shorter. DAY 3: Your first 15 minutes run with one walking interval and a shorter run at the end. Let’s make the walking interval a bit shorter. DAY 1: Let’s drop the walking intervals! Your first 20 minutes run without a break. DAY 2: Another 20 minutes run without a break – because it was so nice the last time. DAY 3: The final increase of duration begins with a continuous run of 25 minutes. DAY 1: Slow and smooth run of 28 minutes, you are almost there! DAY 2: Slow and smooth run of 30 minutes, you are almost there! DAY 3: 35 minutes should allow you to run 5 kilometers at a pace of 7 minutes per kilometer by now. CONGRATULATION – You are a 5k runner now! We hope that you enjoyed every minute of this program. Take some time now to enjoy the moment of an achieved goal too. And keep on running! Are you ready to set even higher goals for your running, or want to just continue the experience of fitness benefits from regular running? Stay tuned to new programs published for Fit Drills Workouts! Looking forward to hearing your experience with this plan! Comments and suggestions are welcome too.